Remember... When the IMF, the UN, or any country says everything is fine... PREPARE FOR THE OPPOSITE. WASHINGTON (AP) — International Monetary Fund chief Christine Lagarde said Thursday that the threat of financial collapse in the global economy appears to have eased. But she warned that developed economies still need to follow through on financial reforms and debt reduction. "We stopped the collapse. We should avoid the relapse. And it's not time to relax," she told a news conference on her outlook for 2013. Lagarde said that big economic powers, including the United States and European countries, had taken important steps to shore up their financial systems but have a lot of work left to do. She warned that there are signs of a waning commitment to regulate the financial sector, despite the severe problems that began with the collapse of U.S. financial institutions in 2008. She said that reforms have been delayed and diluted, and she worries that banks are pushing back against necessary reforms. On the United States, where President Barack Obama is locked in a standoff with congressional Republicans on how to lower the country's deficits, Lagarde said any cuts should be aimed at allowing time for an economic recovery to play out. Mac Slavo: Space watchers have warned that the sun may soon be waking up – as early as today – and it has the potential to direct high powered X-Class solar flares directly at earth. So far today, solar activity is low. However, that could be the calm before the storm. The magnetic field of big sunspot AR1654 has grown more complex. It is now classified as a ‘beta-gamma-delta’ magnetic field, which means it harbors energy for X-class eruptions. If there is a flare today, the blast would be Earth-directed. 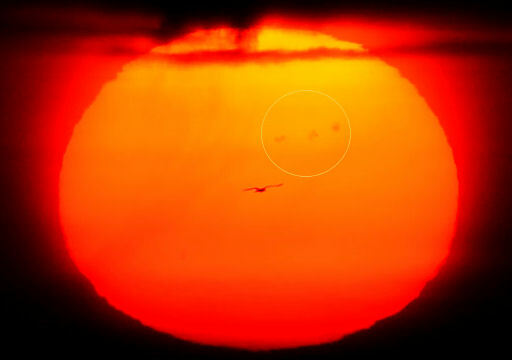 This sunrise shot, taken at dawn on Jan. 16th by Jan Koeman on the bank of the Westerschelde River in the Netherlands, shows how AR1654 (circled) is almost directly facing our planet. Though some ‘C’ and ‘M’ class flares have hit earth recently, none were strong enough to cause any serious, long-lasting damage, save some minor effects on satellites and radio stations. X-Class flares, however, have the potential to wreak havoc across the globe. Similar to the earthquake Richter scale, going up from one class to the next means that the flare is at least 10 times as powerful as the level below it, so an ‘X-1 Class’ flare would be 10 times as powerful as the strongest ‘M’ class flare. components like power grids and utilities, satellite communications, cell phones, transportation systems, and the internet. It’s been theorized that a strong enough solar flare similar to the one that struck earth in 1859, known as the Carrington Event, could potentially wipe out modern day electronic systems and send human civilization back to the 19th century. In 1989, it took only seconds for Hydro-Quebec, the company that supplies power to the Canadian region, to fail when an intense geo-magnetic storm struck earth and caused a cascading breakdown in the electric grid. It is believed that the solar flare which caused the outage was rated at a class of X-15, and luckily only struck a small portion of the northern hemisphere. In July of 2012 an X-1 flare narrowly missed earth. Then come the X-class flares. Although X is the last letter, there are flares more than 10 times the power of an X1, so X-class flares can go higher than 9. The most powerful flare measured with modern methods was in 2003, during the last solar maximum, and it was so powerful that it overloaded the sensors measuring it. The sensors cut out at X28. The biggest X-class flares are, by far, the largest explosions in the solar system and are awesome to watch. Loops tens of times the size of Earth leap up off the Sun’s surface when the Sun’s magnetic fields cross over each other and reconnect. In the biggest events, this reconnection processcan produce as much energy as a billion hydrogen bombs. Should one of these off the chart flares be directed at earth, we could be looking at an Armageddon-like event in its aftermath. Sheriff Tim Mueller's stance on unconstitutional firearms regulations. 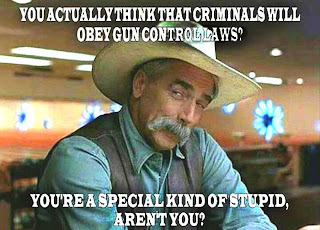 In response to Obama's executive mandates or orders and Biden's proposed gun control legislation. 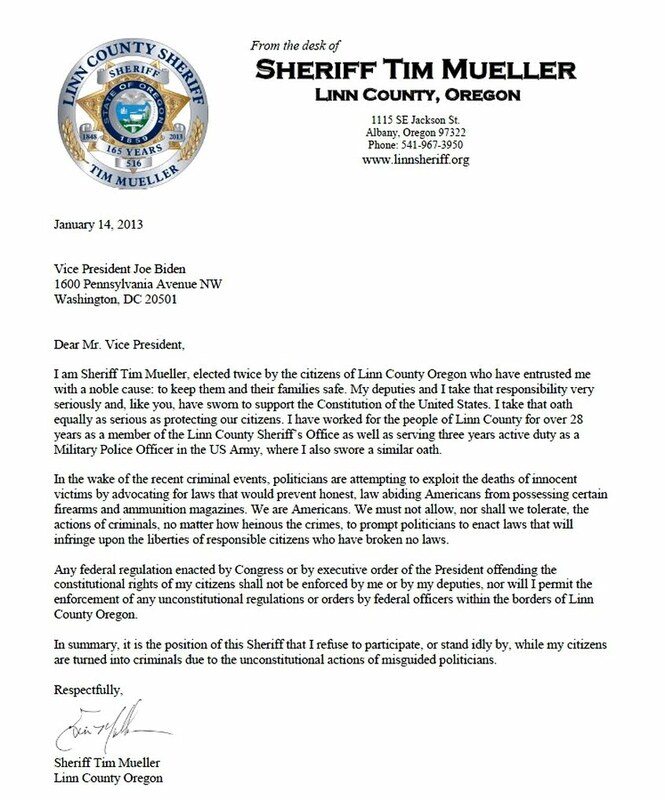 The letter below explains Sheriff Tim Mueller's stance on unconstitutional firearms regulations. If only every sheriff in every county thought like this... We need a lot more Andys (Tim) and a lot less Barneys in this country. Most law enforcement officers and judges have become nothing more than tax collectors without any honest due process. The officer writes the ticket, the judge sets the fine, and the person is taxed at the court clerk's register (Cha-chinggg!). Andy used good old common sense to read a situation and determine if it should be pursued and enforced. Barney was a mindless retard void of discernment at any level. 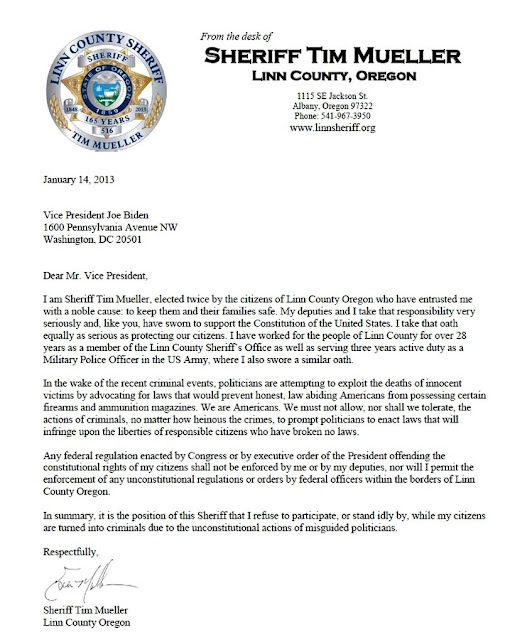 Update: Three more Oregon Sheriffs stand with Tim Mueller. Update: State officials in Mississippi, Oregon and Texas are vowing to fight back against any attempt by the federal government to impose new gun control laws. Update: Add Jackson County Sheriff Denny Peyman to the list: “I talk about what I can do for my county. I can’t stand up for other counties, I can’t do it for them, but I can stand up for my people.” Peyman vowed. The sheriff then spoke about how the media glamorizes mass shootings and makes them appealing to copycat wannabe’s. “In Jackson county, as long as I am Sheriff here, I got children, I got family, I got friends, I got everybody here, and I feel a whole lot better coming into a room if I know everybody is packing, than if I’m the only one, because if they take me out first, then they take everybody else out too.” the Sheriff concluded. Sheriff Denny Peyman should be commended for his fine job in upholding constitutional rights. He is a shining example to other law enforcement officers who should take note of his concerns regarding the ongoing attack on the Second Amendment. Rest assured, Peyman is also not the only Sheriff ready to stand up and defend the rights of his people. Update: Madison County, ID Sheriff Roy Klingler said states passing gun reform are "out of control." "I personally am sick and tired of the government putting regulations in place that affect our personal rights, our property rights and the Constitution," said Klingler. Update: Texas and Wyoming are threatening to arrest any federal law enforcement agent who tries to enforce federal gun laws in their states. Let’s hope more states follow suit. Update: Republican Rep. Steve King, who represents western Iowa in Congress, is a gun-rights supporter who warned during an October 2012 debate against Democrat Christie Vilsack that the purpose of the Second Amendment to the U.S. Constitution “is to guard against tyranny because our Founding Fathers understood that if you did not have an armed populace, a tyrant could take over America.” “So we have a responsibility not just to defend the Second Amendment in words, but do so in deed by hunting and target practicing and also self-defense,” King said. Gun Control... Giving criminals the upper hand. or just visit this page to see the latest image. Refresh the page to see an update. It is updated every two minutes. Don't be lulled into comfort when the solar flare probability is low. It could significantly change in a very short time. I have seen it swing 6% in a span of ten minutes. The X-flare column is the important one. A large class X solar flare in our direction will wipe out our power grid and electronics. A) Guns have only two enemies: rust and politicians. B) It’s always better to be judged by 12 than carried by 6. C) Cops carry guns to protect themselves, not you. D) Never let someone or something that threatens you get inside arms length. E) Never say “I’ve got a gun.” If you need to use deadly force, the first sound they hear should be the safety clicking off. F) The average response time of a 911 call is 23 minutes, the response time of a .357 is 1400 feet per second. G) The most important rule in a gunfight is: Always win – cheat if necessary. H) Make your attacker advance through a wall of bullets…You may get killed with your own gun, but he’ll have to beat you to death with it, cause it’ll be empty. J) In a life and death situation, do something…It may be wrong, but do something! K) If you carry a gun, people call you paranoid. Nonsense! If you have a gun, what do you have to be paranoid about? L) You can say ‘stop’ or ‘alto’ or any other word, but a large bore muzzle pointed at someone’s head is pretty much a universal language. M) You cannot save the planet, but you may be able to save yourself and your family. Barrack Obama - Created more debt than all of the U.S. presidents combined in less than four years; U.S. credit rating downgraded; every energy company that the federal government funded went bankrupt; flagrantly fueling class envy; increased unemployment and the number of welfare and food stamp recipients (EBT); created Obamacare; 2012 National Defense Authorization Act; DHS civilian army created; in his words... "We cannot continue to rely on our military in order to achieve the national security objectives that we've set. We've got to have a civilian national security force that's just as powerful, just as strong, just as well-funded." This is but a sample of the causes of a bloated government and the destruction of the american family.